On the flip side, many people have years of their lives stored in conversations and photos on their accounts. So, what happens if you accidentally delete a message that you really wanted to save, or want to delete a message that you don't want popping back up later? Here are some of your options for managing your messages and chat history. If you're worried about having a record of some of your more sensitive conversations, you can easily delete them from Facebook. Just log in to your account and go to the Messages icon. Both regular messages and chat messages are stored here. Just select a thread you'd like to edit and mouse over to the gear icon labeled Actions. Click on it and a drop-down menu will appear. 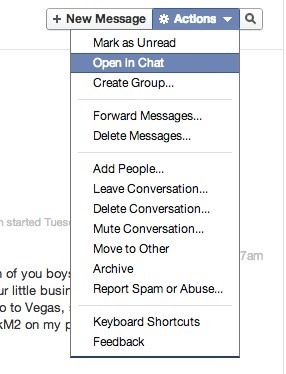 If you're looking to hide a message or thread from your page, but not get rid of it completely, just Archive it. Archiving removes the items from your messages, but they can still be accessed at anytime. If you want that message gone for good, you can delete the entire conversation (all messages within the thread) or just a particular message. You will be warned that any deletion will remove the message from this realm and the next. On Facebook's mobile app, the process is more or less the same. If you have the most recent version, your messages and chats will come in the form of Chat Heads. If you click on a Chat Head, it will bring you into the standard messaging screen, but you can't delete a message from within a Chat Head conversation. Next to your Chat Heads is the standard messages icon (a square dialog box with a mini lightning bolt inside). Click on this icon to see a list of all your conversations and chats. 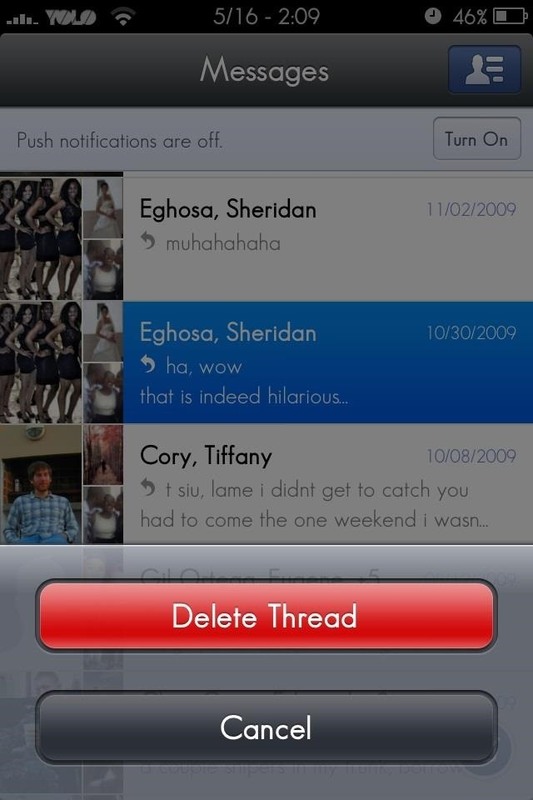 All you have to do is select a message or thread and slide your finger to either side. 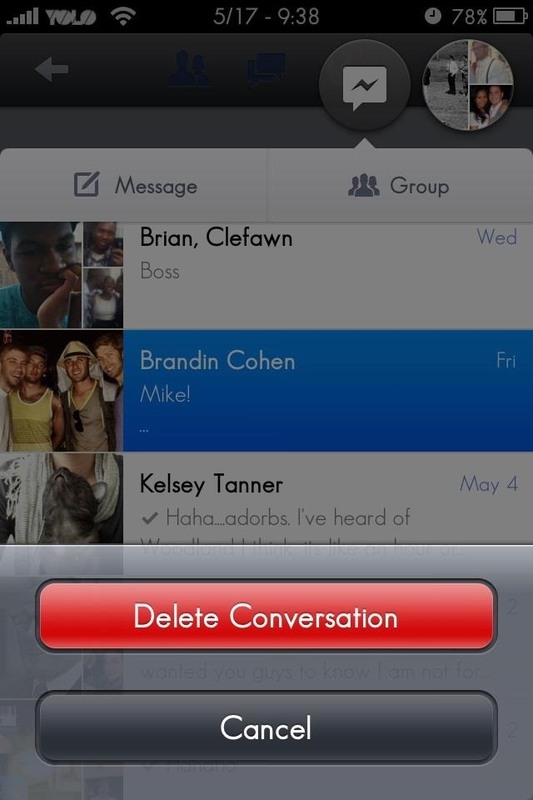 You'll be given the option to Archive or Delete the conversation. If you're using the Facebook Messenger application, the process is nearly identical. The only differences is in the Messenger app, you must slide to the right to bring up the Archive and Delete options. Sliding to the left reveals the chat list and settings. So, can you recover a deleted message or conversation from your inbox or chat history? The simple answer is no. Facebook makes it pretty clear. If you're trying to hack your way into retrieving your chat history, it ain't gonna happen. After so much pushback from users scared of their information being available forever, Facebook implemented the new settings that make it very easy to delete your content—forever. Before doing anything else, check your archived messages and make sure the conversation you're looking for isn't there. You may think clicking on the 'X' next to a message would delete it, but it doesn't—it just removes it from your inbox and sends it to your archive. So, unless you're absolutely certain you hit delete, check there first in case it's just hidden. You can find archived messages by typing the other participant's name or some keywords from the conversation into the search box. To view your entire archive, under Messages click on More, then choose Archived from the drop-down menu. If you did manage to delete an important message or thread from your account, the other person(s) involved in the conversation will still have access to it. While they can't send you the thread via Facebook, they can copy and paste the conversation into a Word document or take a few screen grabs and get it to you that way. To prevent losing messages in the future, there are a few extensions that can help store your history off-site. 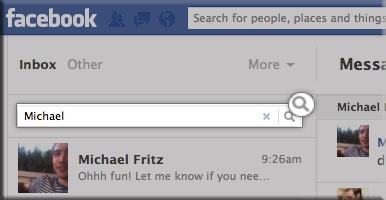 For Firefox users, there's an add-on called FB Chat History Manager. It lets you to save and export your chat history so you never have to worry about losing it on Facebook. For Chrome, there's an extension called Facebook Chat Archive, but it isn't supported anymore and several reviews say it no longer works. Know of any other tricks for recovering deleted messages? Let us know in the comments below. I need help. Someone sent friend request. We chatted for days I confirmed friend request. Suddenly messages won't go through and new friend not showing up. Then got more messages. He has access to my account and I can't find him to block him. 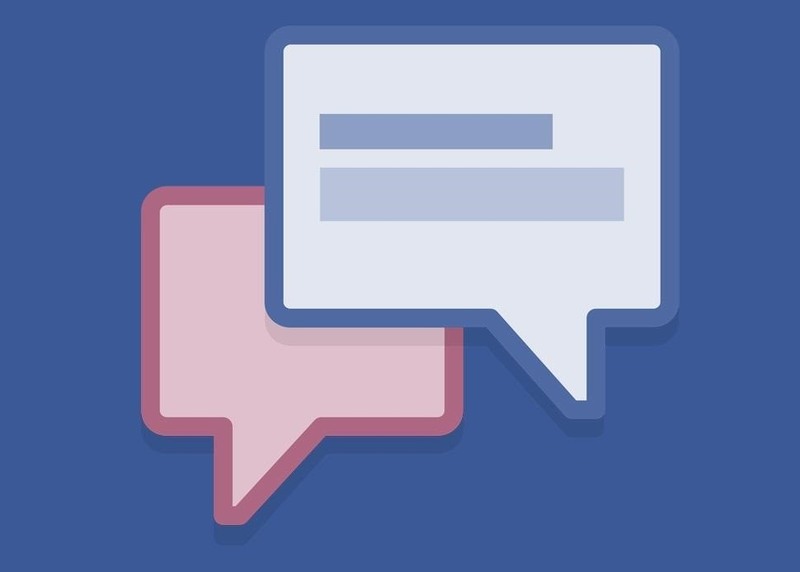 Try this article this will help regarding recover facebook messages. Found on internet. How do you save the voice messages received in your inbox? I mean how do u save it on your phone or PC so that you can listen to it anytime you want even if you are offline? cant i get my deleted chats back ?? Negative. Save them to a text editor in the future and/or use one note or evernote to keep them. Skype has save feature btw. Get your friends on skype (bye). Some of my FB messenger-messages have disappeared with my friend and I did not delete them!! How do I get my conversations back? II had a lot of important info in those conversations with this friend!! someone got access to my facebook acount from different country and deleted my important chat history. it was not me who deleted it.i want my chat history recovered with the help from your facebook team. hi, i really need to retrieve my deleted facebook search history, how can i do that? My issue is a little more complicated. I muted a convo, but I think I muted it indefinitely somehow unintentionally. Then I deleted it. So nowI msg them at all, not even if we're friends. Any suggestions would be great, thanks. This is almost comical. Almost. I started a Facebook messenger video chat with my girlfriend as we do quite often. She's 6,000 miles away in another country. The video turns on suddenly as she's finished the brief sentance to him. Her eyes are looking just off where it sounded like he was standing, saw my video start and looked into the camera with a semi-scared/shocked look. I was asking her, "Who are you talking to?" She stalled a second... "Uh... No one". I hung up. I'm not jealous or paranoid at all. Just tons of things made sense. He can have her - if that's indeed what's happening. It's now killing me to somehow replay this. I'd guess there's no way to see this video converation... I've been through so much chaos this would just be a relief at this point to somehow replay... I didn't record - i just hit the video icon as usual.